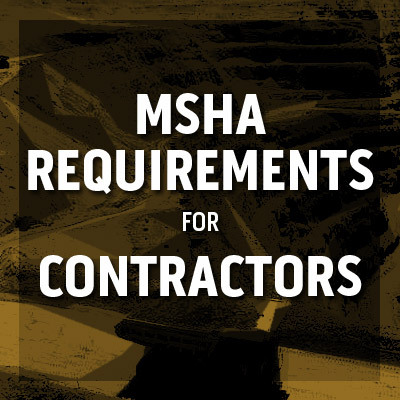 When a contractor is working at a surface mine, it brings up a lot of questions regarding the MSHA Part 46 training requirements for contractors. For example, who’s responsible for what in terms of providing the MSHA Part 46 safety training? And, of course, there are questions about the type of training the contractor needs to receive, who pays, etc. If you don’t know all the ins and outs of this issue now, you will by the time you finish this article. So let’s get started with this overview of MSHA Part 46 training for contract employees. Convergence Training are mining safety and MSHA training experts. Click the links below to learn more about how we can help you. The production-operator has two primary responsibilities when it comes to the employees of independent contractors who will be working at their site as miners. The first is that the “production-operator has primary responsibility for ensuring that site-specific hazard awareness training is given to employees of independent contractors who are required to receive such training under 46.11…”. That’s from 46.12(a)(1). You can read more about the Part 46 requirements for site-specific hazard awareness training here. The second is to “provide information to each independent contractor who employs a person at the mine on site-specific mine hazards and the obligation of the contractor to comply with our (‘our’ means ‘MSHA” there) regulations, including the requirements of this part.” That’s from 46.12(a)(2). Now let’s look at the independent contractor’s responsibilities for Part 46 training for his or her workers (who are considered “miners” under 46.2). The independent contractor “has primary responsibility for complying with 46.3 through 46.10 of this part, including providing new miner training, newly hired experienced miner training, new task training, and annual refresher training.” That quote’s from 46.12(b)(1), and those links take you to the MSHA site that explains each of those Part 46 training programs in more detail. Note that because 46.12(b)(1) says the independent contractor is responsible for complying with 46.3-46.10, that includes creating a training plan (46.3) and keeping records of training (46.9). Who Pays the Contractors While They’re Training and How Much? That’s our little overview of MSHA Part 46 training for contractors. If you had some questions or confusion before, we hope we’ve addressed them. Of course, feel free to use the comments section below to write any of your own thoughts or other questions–we’d love to hear from you. 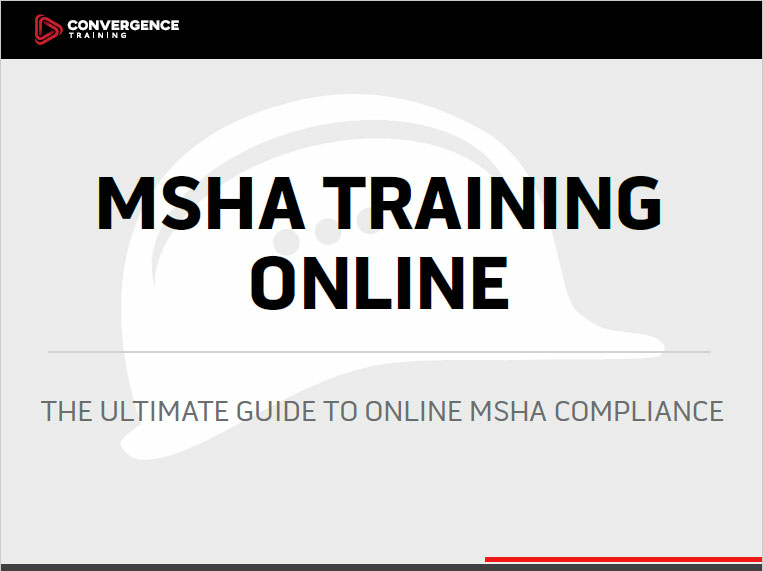 Here’s a short, two-minute video overview of our LMS for Mining Safety/MSHA Compliance, a tool that can help you with your MSHA Part 46 safety training and compliance. And this free guide gives you more information about how online training tools can help you with Part 46. So if I understand you correctly, if my company is hired to put up a steel building on a mine site, that’s it, I am going to need over 14 hours of training for each person I put on that site? In addition, I will have to put them through a site-specific training once they arrive onsite? It would sure seem to me that they are Non-Miners. In particular, check out 46.29(g)(1), which I’ve copied below. If you’d like to chat about this more, let us know. Joe, I asked one of my coworkers to follow up with you using the email you left here as well. I replied first because it was before office hours, but it’s 8 am here now and folks are in the office, so you’ll be hearing from my coworker shortly. He’ll be able to more fully explain and to answer any additional related questions you may have. In case Joe sees this blog post comments section before he checks his email inbox, or for the benefit of anyone else who’s reading along at home, here’s a fuller reply my coworker Bjorn Ansbro (the Marketing Director here at Convergence) sent to Joe via email. We hope this is helpful to Joe but also of course anyone else reading along. 1. It’s always best to get information, clarification, and official interpretations re. the regulations directly from MSHA. There should be state-level offices with MSHA representatives available to offer feedback. 2. The mine operator for whom your company will be performing the work will likely have the final say. So, connecting directly with them as well is extremely wise. With the exception of law enforcement and MSHA inspectors, MSHA affords mine operators the authority to allow or deny access to their site at their discretion. And from my experience, mine operators are averse to liability exposure, tending toward even more strict adherence to MSHA training regulations for contract workers. And these two documents are important reference for understanding what your training and documentation requirements are for MSHA Part 46 as a contractor. After confirming if you’ll be performing work at a Part 46 or Part 48 mine, your next step should be to have a clear understanding of how MSHA defines an “independent contractor.” Please note that if your company and its workers are considered independent contractors while performing construction work, your workers will be required to complete a minimum of 24 hours of MSHA new miner training. Just like a miner. MSHA makes no distinction between miners and contractors at that point. A miner is a person, including any operator or supervisor, who works at a mine and who is engaged in mining operations. This definition includes independent contractors and employees of independent contractors who are engaged in mining operations; and construction workers who are exposed to hazards of mining operations for frequent or extended periods. The definition of “miner” does not include scientific workers; delivery workers; customers (including commercial over-the-road truck drivers); vendors; or visitors. Commercial over the road truck drivers are required to have Site-specific Hazard Awareness Training. Part 46 affords operators the discretion to tailor Site-specific Hazard Awareness Training to the unique operations and conditions at their mines. However, the training must in all cases be sufficient to alert affected persons to site-specific hazards. Under Part 46, Hazard Awareness training is intended to be appropriate for the individual who is receiving it and that the breadth and depth of training vary depending on the skills, background, and job duties of the recipient. This definition of “miner” also does not include maintenance or service workers who do not work at a mine site for frequent or extended periods. “Frequent” exposure is defined as a pattern of exposure to hazards at mining operations occurring intermittently and repeatedly over time. “Extended” exposure means exposure to hazards at mining operations of more than five consecutive work days. I know that it can sound excessive for contractors to be required to complete 24 hours of training, just like a new miner. And in reality, we all know that construction workers are not miners, but from a regulatory standpoint, MSHA treats them the same. So, the likelihood is that both the MSHA regulations and the mine operator will require your workers to show documentation that verifies completion of MSHA Part 46 new miner training (assuming the site falls under Part 46 regulations) prior to performing work at the mine. Hopefully that helps offer some guidance toward staying compliant. Again, the mine operator and MSHA themselves will be your ultimate resources for next steps. But I’m always happy to offer help along the way. The point of your question, as I understand it, is whether you have to do this based on being at the mine site for a visit that’s not frequent nor extended. And I can see how you’d make the argument that is your case (not frequent, not extended). And good luck! And feel free to come back here and let us know what you hear. Jeffrey, I have some questions on paying the miners for their New Miner. If having their New Miner is a pre-requisite to getting a job with our, and they get their training through their own choice of training schools, prior to being hired by us, are we required to reimburse them once they are hired on through our Company? To be 100% honest, I’m not sure that I know the answer to your question. My point about the quote above is that it calls for an introduction to the work environment, which is something an external third-party presumably couldn’t provide. And my points about the quote above is that it says training must take place during normal work hours and the employee must be compensated for those work hours during which training is completed. Technically, a brand new hire with no experience WOULD have less than 12 cumulative months of surface mining experience, so one could argue this applies, but I’m not sure if that’s the “spirit” of the regulation and I’m not sure how an MSHA inspector would interpret that (but think it’s possible they wouldn’t be persuaded). Let us know if you still have questions. I’ll try contacting you via email too. Good luck! How does a contractor performing strictly maintenance on equipment at a facility receive the 16 hr onsite training to complete the 24 hr training? As a contractor (for MSHA Part 46 training at surface mines), you’re not required to complete 16 hours onsite. You can do it entirely offsite and online. However, you’ll want to have someone “proxy” you to be sure you’re taking the training and to answer any questions you have. That person would not have to be someone who works for the mine. It would be someone who works for your own (contracting) company. That person plays the “Person Responsible for Health and Safety Training” role as described in Part 46. That same person will also sign your certificate.